An Alberta calf may have set a weight record, but Dot, a Charolais-Red Angus cross, wasn't going to be outdone. She gave birth to live quadruplets on Tuesday. It seems that cows on the prairies are doing their best to set records. On Monday, an Alberta cow gave birth to a humongous heifer that tipped the scales at 94 kilograms. 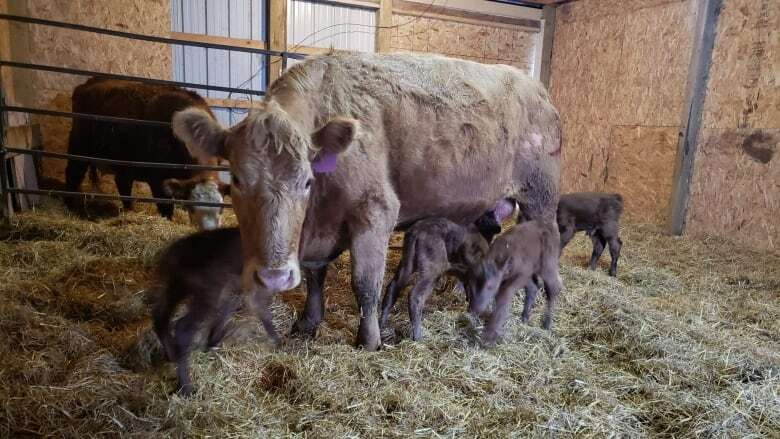 Not to be outdone, a Saskatchewan cow had quadruplets — with a total birth weight four kilograms higher than the Alberta calf. 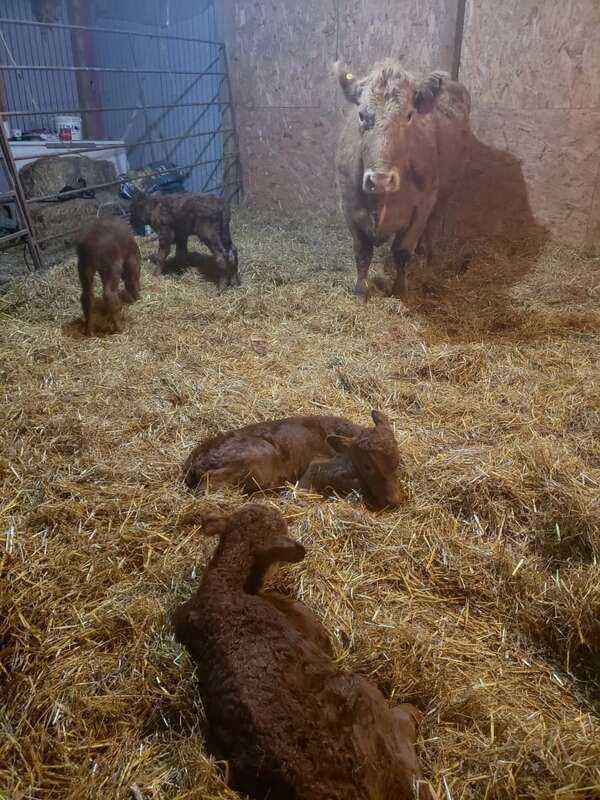 The Charolais-Red Angus cross is named Dot and it happened on Carman Moxham's farm near Leross. "Trixie was 41, Dixie was 55, Moxy was 56 and Ben was 65 pounds. That's total birth weight of 217 pounds [98 kilograms], which is amazing size to carry by one animal," said Moxham. Until Thursday the cow was only known at No. 46 on the Moxham farm. But after this incredible birth, he decided to name her Dot, after his own mother. Moxham said Dot is kind of a super mom in the bovine world. In the past five years, Dot has given birth to 16 calves, although not all of them have survived. Moxham said they knew Dot was going to have another multiple birth this year, because she was huge. They didn't expect she was going to have four calves. "We brought her in early on, gave her a little extra love, a little extra attention, and some better quality feed ... and try not to cause her any stress," Moxham said. Moxham said throughout the cold weather, she had her own personal place to bed down in the barn and her special little ration that no one else was getting. Quadruplets are rare. The Western College of Veterinary Medicine said it's about a one in 700,000 chance. To have four calves born live and survive, like Dot has, pushes the statistics into the one-in-several-millions category. Moxham said Dot got pregnant the old-fashioned way — artificial insemination was not used. He also said it's been an exciting few days. "When it comes to farming, there's a lot of downs, and a lot of expense. But when you run across something like this, it's like a little shining star."